P. x ‘Kusum Krishna’, (European, Section Auricula) is a hybrid made by Graeme Butler of Rumbling Bridge Nursery, Scotland. 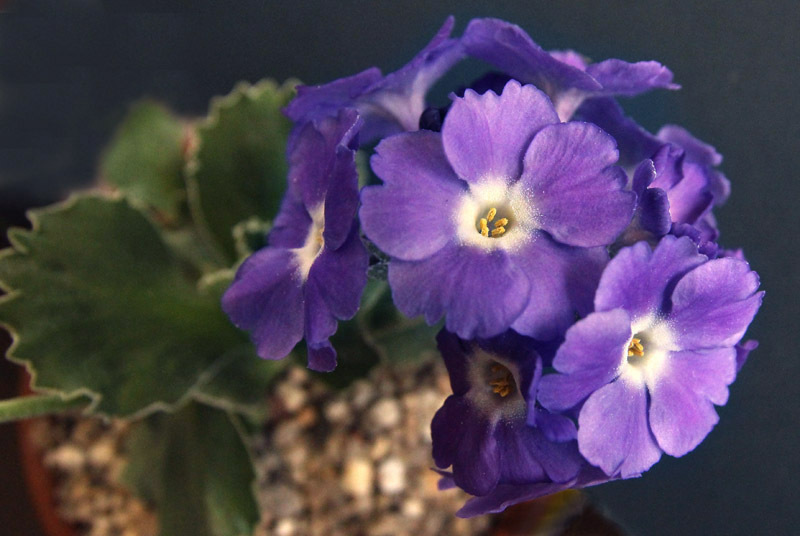 He skilfully crossed the violet flowered and white farina edged leaf of P. x ‘Wharfedale Bluebell’, with the mauve, white eyed flower and crenate foliage of the pollen donor, P. x marginata ‘Linda Pope’. 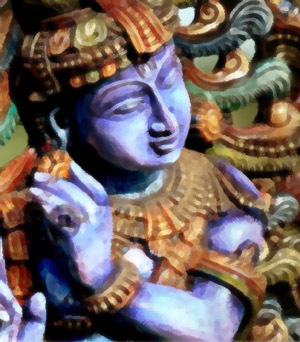 The result was the beautiful ‘Kusum Krishna’. The plant was named so by a Hindu friend of the Nursery, as it reminded him of his beloved Lord Krishna, described in sanskrit text as having the colour of newly arrived monsoon clouds. I purchased a plant from Rumbling Bridge Nursery in September 2011 and have kept it in a raised bed in the Alpine house, but I intend to divide the plant this spring, trying a cutting outside in a crevice bed. The stemless leaves are an advantage over those of its parents, especially when being potted for showing, as they usually require to be ‘potted low’ i.e. the plant/stems are sunk below the topdressing used to surface the pot, for presentation purposes. Flowering time is April.